American teenagers morph into Japanese Power Rangers. The premise is: a group of teenagers change ("morph") into superheroes. 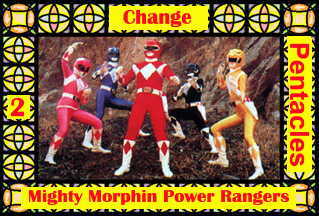 Besides that, the MMPR changed into the Alien Rangers, Power Rangers ZEO, Power Rangers Turbo, and Power Rangers in Space. Every season we have some change in cast. The first season or two, the morphed rangers were from Japanese movies (and the yellow ranger was male--pretty good morph for an American girl!). This is the card of "the more things change, the more they stay the same." Any superhero with a secret identity. Any celebrity who keeps having plastic surgery.